I was negative forty-six years-old in 1941 when Walt Disney released his fourth (and shortest) animated feature, Dumbo, a mere forty-five or so days before the attack on Pearl Harbor. To watch the original animated feature now is to see little more than simplicity and a cautionary tale about bullying, but in the wake of the context in which it was received initially it could certainly be perceived that a simplistic escape mixed with a prevailing underdog (or elephant) story might have been exactly what the country ordered. The question then posed to director Tim Burton's new, "live-action" take on the film is what might it mean to those who decide to take in this new experience? What is peculiar about choosing the 1941 film for an updated re-imagining is the fact it is without doubt an experience that will not hold the same nostalgic meaning for the majority of the audience that ventured out to 2017's Beauty & the Beast nor does it feature any of the explicit technical wizardry of 2016's The Jungle Book. 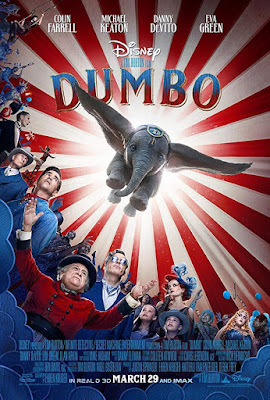 This is the latest film in a string of Disney re-makes that, at their best, can be soulful and moving (Pete's Dragon) and at their worst can be derivative and dull (Alice in Wonderland), but while Dumbo comes to us from the same auteur who ushered in this recent craze with that aforementioned "worse-case scenario" that is Alice in Wonderland, Dumbo seemingly finds Burton not necessarily taking note of what others have done with similar opportunities, but more investing himself more wholeheartedly in the material; caring as much about the themes and ideas that populate his world as he does the design of the world itself. Burton is often referred to as a "visionary"director and this comes more from the fact he has a signature style than it does the fact he's consistently innovative or wise beyond comprehension, but while-as with many of his more recent endeavors-the sheen may have worn from Burton's visual prowess, Dumbo is something of a welcome return in that it is a streamlined, inoffensive, and largely harmless tale that simplifies the more recognizable themes Burton has worked in throughout much of his career. Sometimes simplicity is what's needed, what's necessary, and what connects viewers to material more effectively. Burton's Dumbo doesn't break any new ground, but it does keep the emotional beats intact, preserving their poignancy. Who knows, maybe a simple reminder about placing yourself in someone else's shoes is exactly what the country needed right now even if we didn't order it.